SAP’s column-oriented, in-memory database, that combines OLAP and OLTP operations into a single system, or in other words, SAP HANA originated from a research started in 2006 by SAP’s co-founder Hasso Plattner while he was a computer science professor at the Hasso Platner Institute in Postdam, Germany. SAP HANA is an enterprise platform designed to handle a huge amount of data and a large number of applications in support of mission-critical business. By platform, we mean that it is not only a database anymore. Application developers can build applications and data scientists can run advanced analytics and machine learning directly on SAP HANA, and database administrators can integrate their landscape within the SAP HANA database management tools. SAP HANA provides features for multi tenancy, high availability, disaster recovery, and dynamic tiering to help ensure 24×7 access and smooth horizontal and vertical scaling. SAP HANA also lets you access a wide variety of data sources and support Big Data and the Internet of Things. 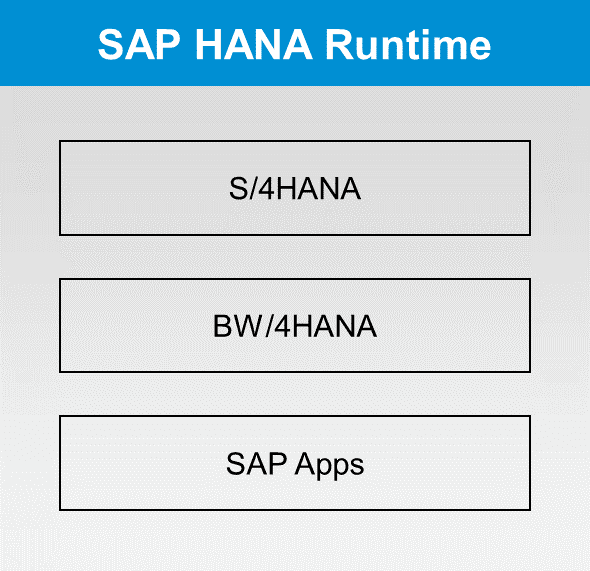 SAP HANA Runtime Edition is limited to a runtime environment for SAP Applications. An SAP Application is any application that includes a NetWeaver Application Server, e.g. SAP Business Warehouse (BW), SAP BW/4HANA, SAP Business Suite, SAP S/4HANA and other related products. 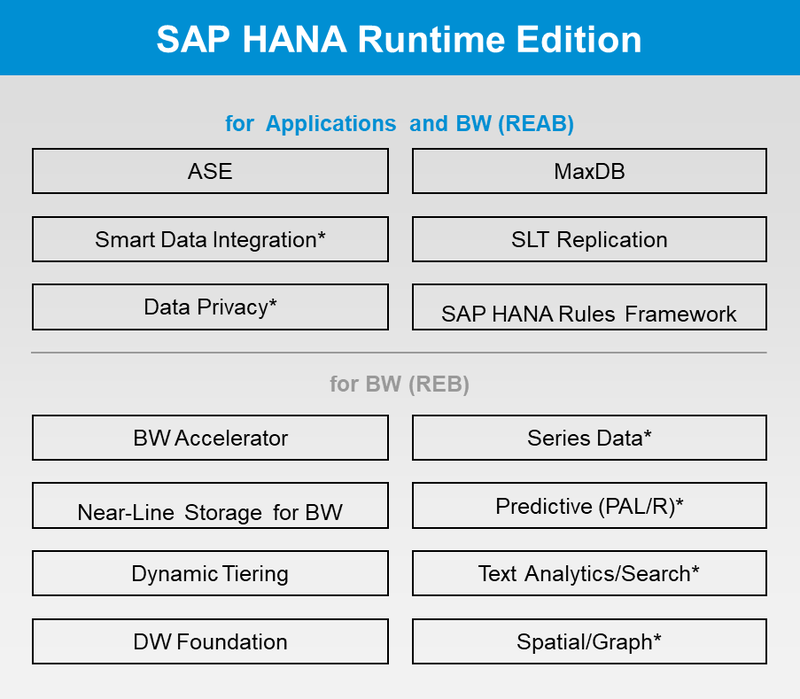 ◈ SAP HANA Runtime Edition for Apps and SAP BW (HANA REAB), which includes all capabilities from REB, plus other SAP Apps. The picture below shows the available features of both for these options. The options marked with * have some restrictions regarding data processing. SAP HANA Runtime Edition is considered an integral part of the application itself, so that any kind of data processing (modeling, administration, creation of data structures and use of advanced analytics) must be done by this application, via the application layer (where the interface can be either from SAP or a 3rd party provider). 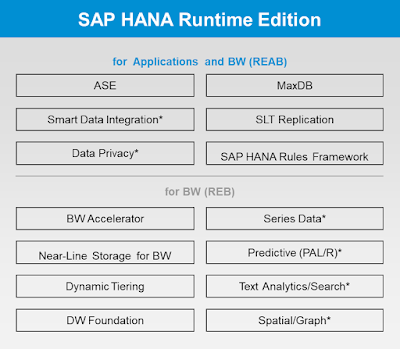 With SAP HANA Runtime Edition, the data from the application can only be displayed or graphically processed at the front-end application and any direct connection to the database bypassing the application is a license violation. The picture below shows not only the available SAP HANA capabilities, but also the restricted (Δ) and not included (X) ones when SAP HANA Runtime Edition is licensed. 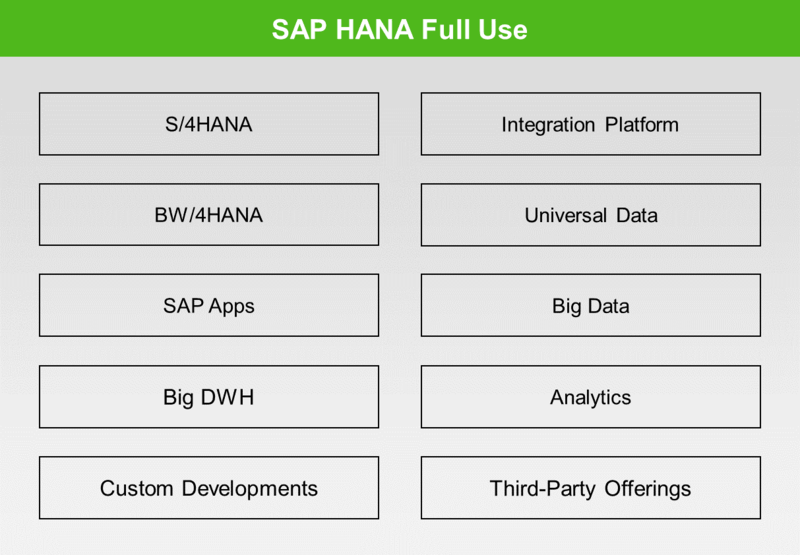 SAP HANA Full Use Edition offers an unrestricted platform for any combination of SAP, non-SAP, custom, third-party, and hybrid applications. 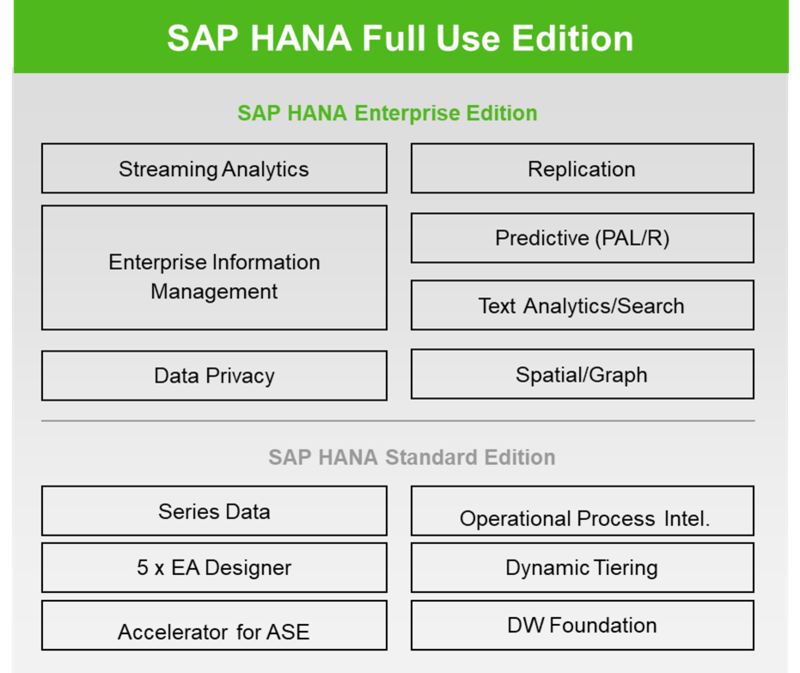 With SAP HANA Full Use Edition there are no limitations on data modeling, administration, creation of custom structures, and use of advanced engines via HANA Web IDE, HANA Studio (IDEs used to develop artifacts on a HANA server) or other applications. There are no limitations on loading and exporting of SAP & non-SAP data directly into and out of SAP HANA. With the Full Use Edition it is possible to read data both from the application and database layers. 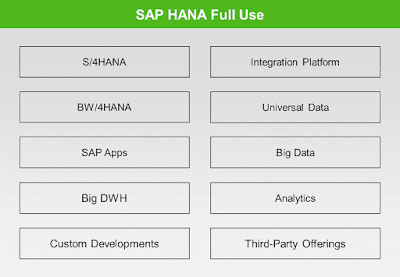 You can consume the data of the SAP HANA system whichever way you need it. 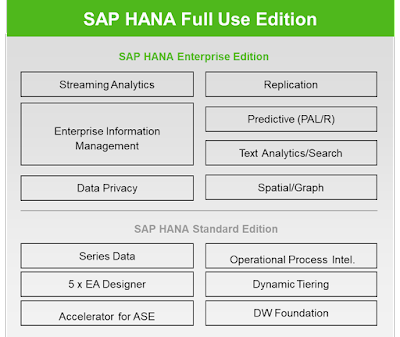 ◈ SAP HANA Enterprise Edition (includes all capabilities from the Standard Edition). The picture below shows the available features for both editions. ◈ Streaming Analytics Option, for processing streams of events and messages in real time, allowing some or all of the data to be captured in the SAP HANA database and/or Hadoop. Basically, if you license all available options on top of your SAP HANA Standard Edition, your SAP HANA system will have the same capabilities as the SAP HANA Enterprise Edition. SAP HANA Enterprise Edition includes the full range of functions and features from SAP HANA, being the foundation of SAP’s data management solutions and the Intelligent Enterprise. The HANA platform allows for a development with no data transfers, no data duplication and no data latency, because the processing is done within the database itself; and the powerful technical capabilities of SAP HANA can be utilized. With this, we can have faster time to value and we can have lower development and maintenance costs. Conceptually speaking SAP HANA Runtime Edition offers a limited platform, centralized only for SAP applications and SAP HANA Full Use Edition offers an unrestricted platform for all systems and distributed data in modern, hybrid environments. The picture below provides an overview of the biggest technical differences between these two editions. For SAP HANA Runtime Edition we’ve included restricted (Δ) and not available (X) capabilities. In terms of functions and features, the picture below compares the difference between the two available editions. To sum up, the decision of choosing which edition is best for you depends on whether you want to leverage SAP Applications, or you want to use the full power of the SAP HANA platform. If you are just looking for a faster database that supports your SAP applications SAP HANA Runtime Edition is the right choice, but if you are looking for a long-term and strategic solution, you need SAP HANA Full Use Edition. Making the right choice here will depend on your company’s needs. Even if you license SAP HANA Runtime Edition based on your current requirements, but your long-term roadmap calls for SAP HANA Full Use Edition, SAP supports this transition both commercially and technically. SAP HANA Active/Active (Read Enabled) is a solution that targets resiliency and better performance of your SAP HANA productive environment. With this option you can offload intensive read operations to the secondary system, freeing up more computational power to be used on the primary system for read and write operations. As data is continuously being replicated from the primary to the secondary system using either synchronous or asynchronous communication protocols, you can leverage the secondary system to offset read-intensive workloads from the primary system. With SAP HANA Active/Active (Read Enabled) you can gain usage rights to access secondary system for productive read-enabled operation, the utilization of the underlying hardware can be increased because the workloads can be much more balanced, which also improves the performance of the operations on the primary system. Latency can also be reduced as read intensive users can now be located next to the secondary data center and there is no impact on your Recovery Time Objective (RTO) and Recovery Point Objective (RPO). Without SAP HANA Active/Active (Read Enabled), the secondary system can’t be used for any operation, which means it’s only idle capacity for High Availability and Disaster Recovery purposes. This option can either be used by SAP HANA Runtime and Full Use Editions as you can check below. Only SAP HANA 2.0 works with this option. All the different versions of SAP HANA that we have introduced are enterprise-ready, meant to be run in productive environments. What if you are a programmer who wants to run SAP HANA on a local PC, or on a cloud service offered by a Hyperscaler (AWS, GCP, Azure, …) ? SAP HANA, express edition is the best way to test out and get hands on with SAP HANA, being available to install on your local laptop or desktop computer, a local server, or in the cloud. This means you can now use the express edition of SAP HANA on devices other than existing, SAP-certified, hardware appliances, or access it from the SAP Cloud Appliance Library tool on either Amazon Web Services, Microsoft Azure or Google Cloud Platform. This edition allows you to jump-start application development on top of SAP HANA today and move to other editions of SAP HANA (i.e. 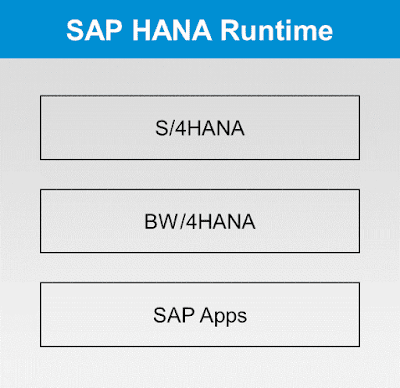 SAP HANA Runtime or Full Use Edition) as your needs to grow tomorrow. Developers and independent software vendors (ISVs) can start using the express edition of SAP HANA at no cost to build and deploy applications that use up to 32 GB of memory. You can expand the use of your existing SAP HANA Express Edition for a fee, paying incrementally for up to 128 GB of memory use. 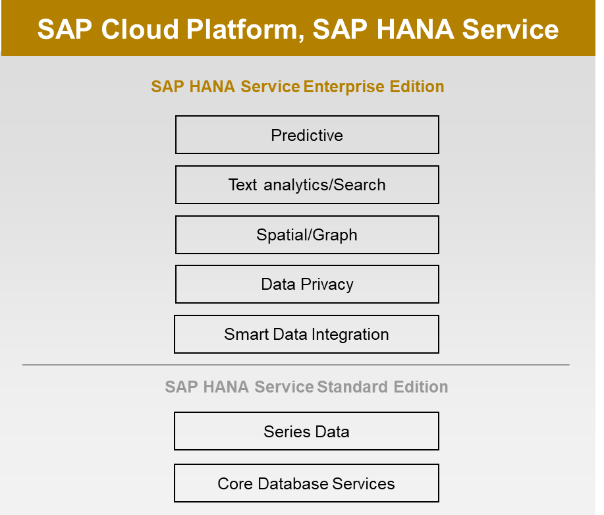 The SAP HANA service (officially called SAP Cloud Platform, SAP HANA service) allows you to leverage the in-memory data processing capabilities of SAP HANA in the cloud. As a managed database service, backups are fully automated and service availability guaranteed. 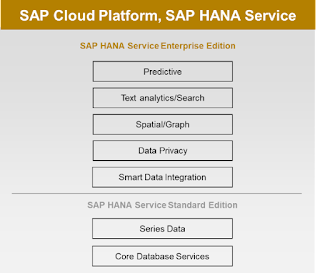 Using the SAP HANA service, you can set up and manage SAP HANA databases and bind them to applications running on SAP Cloud Platform. You can access SAP HANA databases using a variety of languages and interfaces, as well as build applications and models using tools provided with SAP HANA. There are multiple cloud deployment options available for SAP HANA service: it can be deployed in the Cloud Foundry environment or in the Neo Environment from SAP Cloud Platform. The Cloud Foundry environment is based on Amazon Web Services, Google Cloud Platform or Microsoft Azure while the Neo environment is hosted by SAP. SAP HANA service is available in two editions: Standard and Enterprise (similar to the editions available for SAP HANA Full Use). Standard Edition only includes core database services with in-memory capabilities as well as smart data access. 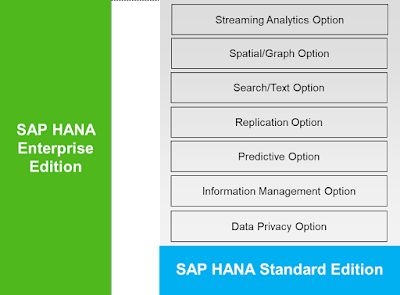 Enterprise Edition includes all SAP HANA Service Standard Edition capabilities including advanced analytics options and smart data integration.